Targeted campaigns are vital for accomplishing tangible results from inbound. At the same time, many marketers struggle with planning, running, and evaluating successful marketing campaigns. 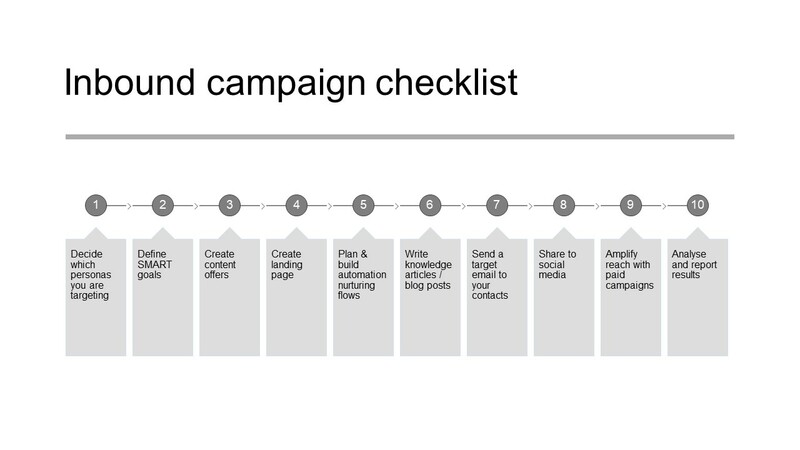 This post will give you a step-by-step checklist for running a successful inbound campaign. Once you have the essential components of your inbound strategy in place—that align with the overall business strategy—it’s time to encourage your target audience to take meaningful action with your brand. One of the best ways of doing this is through campaigns. An inbound campaign is a structured way of targeting your content towards a particular segment of your intended audience (i.e. your personas), with specific objectives and goals. The objectives and goals of a campaign should align with your overall strategy and count towards the aggregate of your overall objectives. Additionally, by communicating the results of campaigns, you’ll be able to clearly show your organisation what you are generating through your inbound efforts. You can either reuse already existing content and organise it into a campaign or develop new content tailor-made, e.g. for a product release, an event, or a specific offering. Ready to take your inbound efforts to the next level? Download the PDF below for a step-by-step checklist for implementing your inbound campaign!